Home / How to set up ELEX WooCommerce Catalog Mode, Wholesale & Role Based Pricing? This article intends to provide detailed, step-by-step instructions that’ll help you set up ELEX WooCommerce Catalog Mode, Wholesale & Role Based Pricing plugin. Refer the product page to know more about other various features of the plugin. With this plugin, you can achieve catalog mode, wholesale pricing, and role-based pricing on your WooCommerce store. 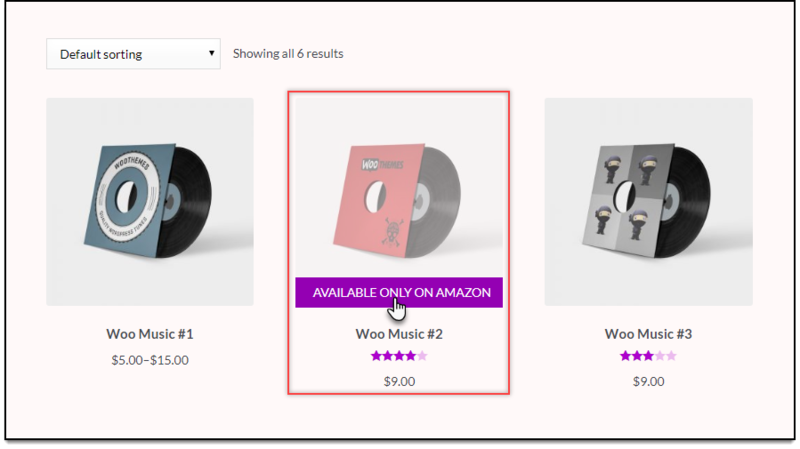 To begin with, you can turn the WooCommerce store into a product catalog. You can also remove or customize Add to Cart button and hide product prices based on different user roles. The plugin provides an option to offer a discount or add markup price, by adjusting the price. This price adjustment can be applied to all products, specific product categories as well as specific product(s), based on user role. In addition to this, you can configure a custom interface for unregistered/guest users by removing or customizing the Add to cart button, hiding only regular price or product prices completely, and hide Cart and Checkout pages for Guest users. Not only can you configure product prices based on user role, but tax options as well. How to set Product price based on User role? How to setup Role-based price adjustment at Product level? How to set up role-based pricing for Product variations? How to set up Catalog mode for an individual product? How to adjust prices based on User role? How to remove Add to Cart button for a specific product? How to prioritize User Roles? 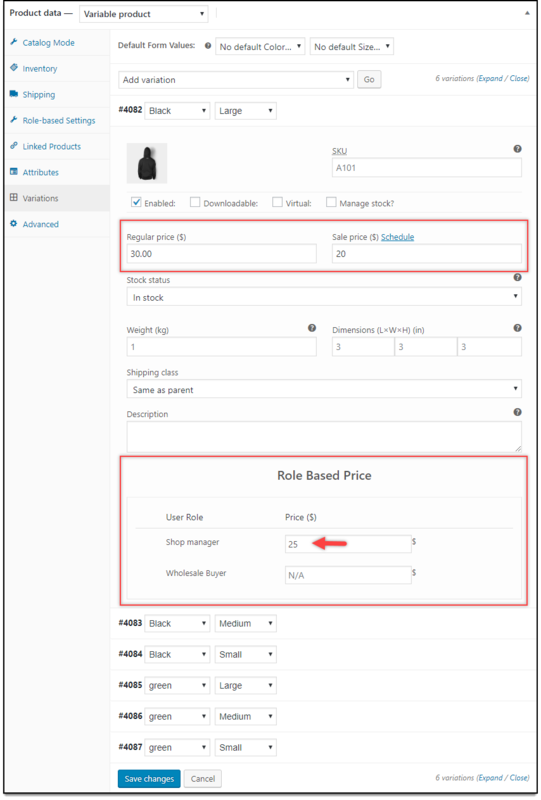 Offer Role-based pricing: Configure WooCommerce role-based pricing for all products, or at the product level. These user roles may include, Customer, Whole seller, Vendor, Vendor Manager, Subscriber and so on. Individual product adjustment: Handy options to configure settings for guest and registered users at the product level. Price adjustment based on product category: Adjust price based on product categories, for each user role. 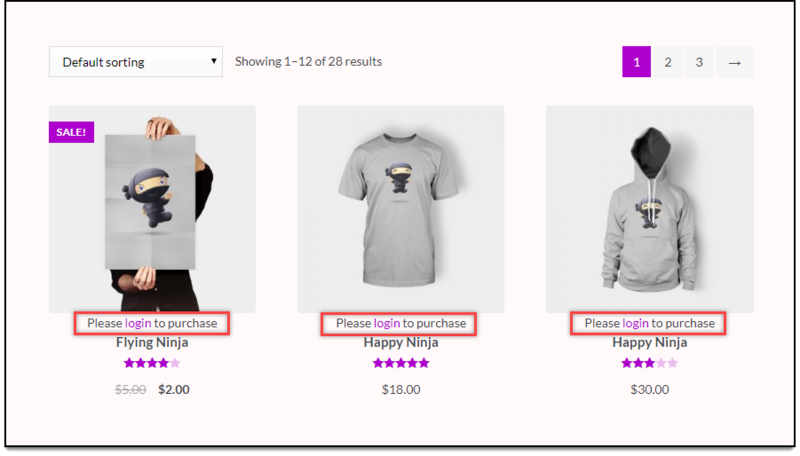 Custom interface for unregistered users: Turn your store into catalog mode, by customizing Add to Cart button and/or product prices for guest users of your WooCommerce store. 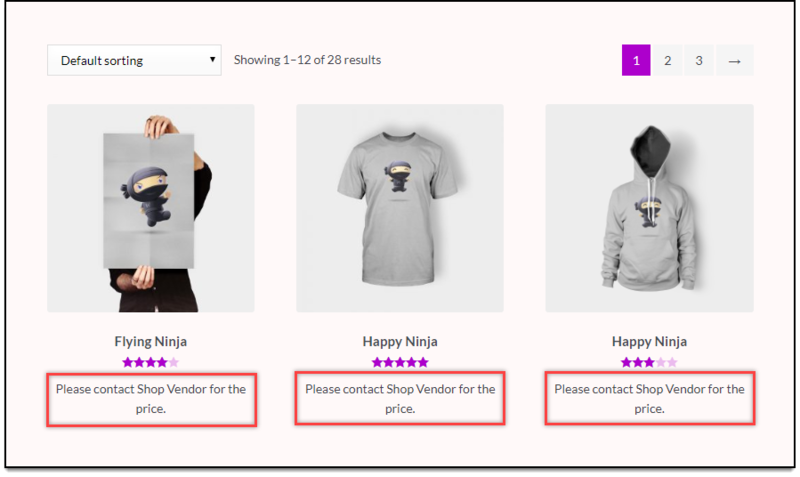 WooCommerce Catalog mode: Turn your WooCommerce store into product catalog invariably, or for specific user roles. Custom Tax display option: Assign custom tax class and tax display options for each user role. You can specify suffix text based on user role too. Creating Custom user role: If the existing user roles don’t match your requirement, the plugin provides intuitive steps to create custom user roles. These user roles are limited to the plugin itself. All these features (and many more!) are bundled into one solution to serve your WooCommerce Catalog mode, WooCommerce product catalog, WooCommerce wholesale pricing, and WooCommerce role-based pricing needs for your online store. Remove the Add to Cart button & replace with a custom HTML text, based on user roles. Customize the Add to cart button for product page & shop page (adding a custom URL as well). Hide only regular price (when the sale price is applied) or hide product price based on user roles, by replacing the price with a custom text message. Hide Cart and Checkout page based on user roles. Markup and Discounts adjustments on products, based on user roles. Remove Add to Cart: Select desired user role(s) from the drop-down list, for which Add to Cart button has to be removed. The list contains all WordPress users as well as custom users created in the plugin. You can replace the Add to Cart button with a placeholder HTML text. A sample screenshot depicting removal of the Add to Cart button and replacement with custom HTML text is shown below. Customize Add to Cart: This setting will allow you to replace the Add to Cart button text with a custom text on both the product page and shop page. It will also allow you to redirect your customer to a custom page (or external website). Once you select a user role, further settings appear as shown in the screenshot below. Below is a sample screenshot depicting replacement of Add to Cart button. Hide Regular Price: Select user role(s) from the drop-down list to hide regular product prices. Remember, you can only hide the prices of simple products, which have a sale price. Hide Price: Select user role(s) for which you wish to hide product price. Once you select a user role, a placeholder text option appears, where you can specify the replacement text for the same. The below sample screenshot depicts product price hiding. 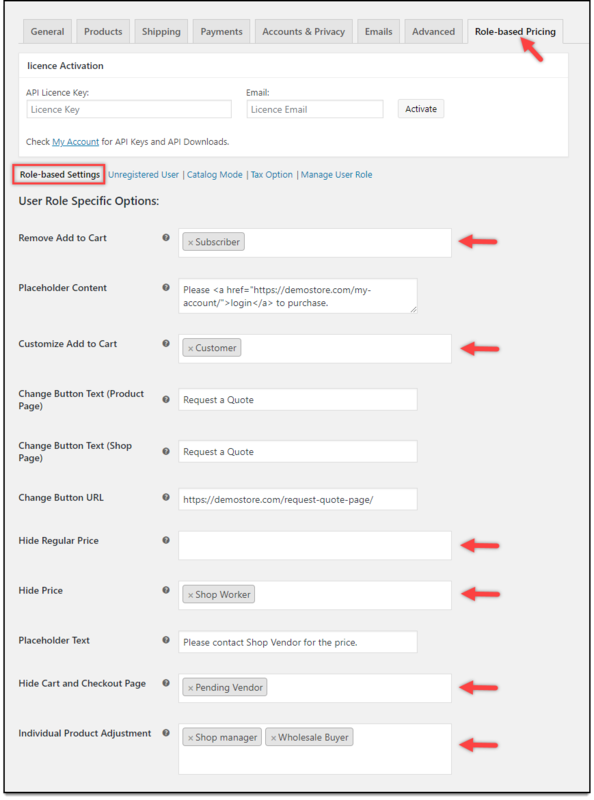 Hide Cart & Checkout Pages: Select user roles(s) for which the cart and checkout pages should be hidden. 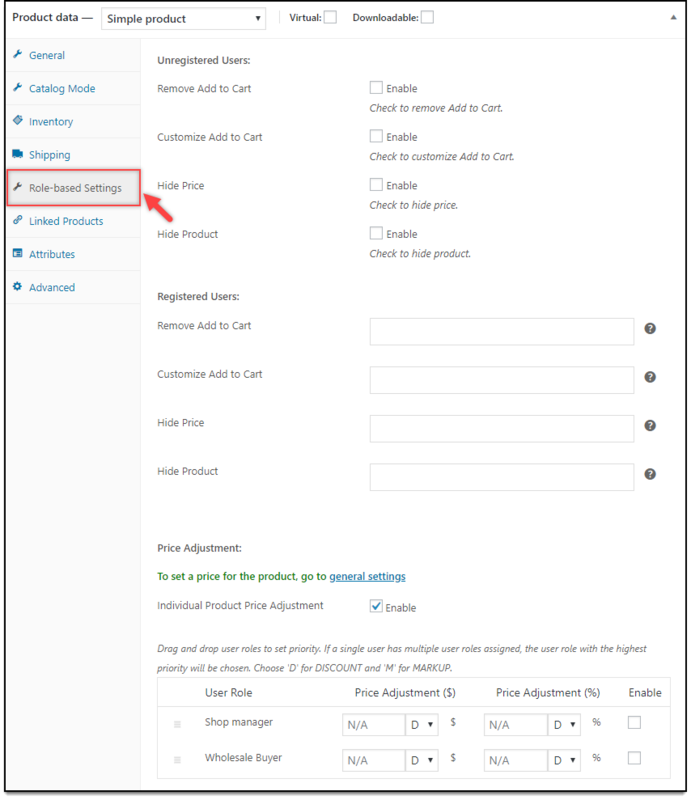 This setting is useful when you create a product catalog for your WooCommerce store and do not need cart and checkout pages. 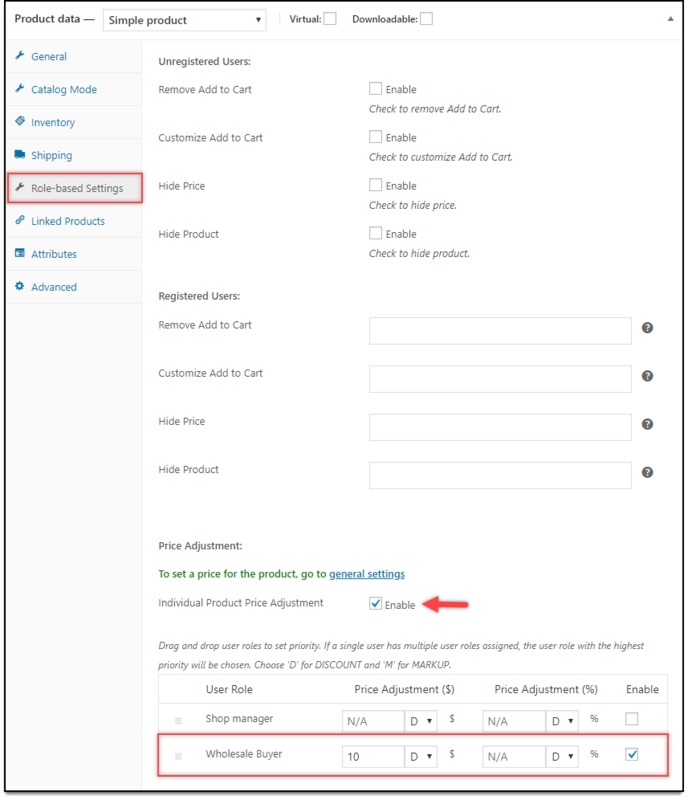 Individual Product Adjustment: If you want to configure price adjustment at the product level, select the desired user role(s) from the drop-down list in this setting. Once this setting is saved, you can notice the Role Based Pricing settings appear in every product settings (under product data meta-box) for specified user role(s). This table helps in setting role-based pricing adjustments. You can adjust prices by providing a discount on actual price, or increase the price by the specific amount (markup). To offer a discount, enter a value in the price adjustment field and select option “D”. For markup, select the option “M”. You can mention the value in amount and percentage for each user role, as required. After the discount is applied, if the price of the product is less than zero, then the regular price/role based price of the product is displayed for sale by default. The table consists of the following columns. Price Adjustment On: You can apply the discount/markup on either Sale Price, or on both Regular Price & Sale Price. In the above screenshot, all the available user roles are displayed. 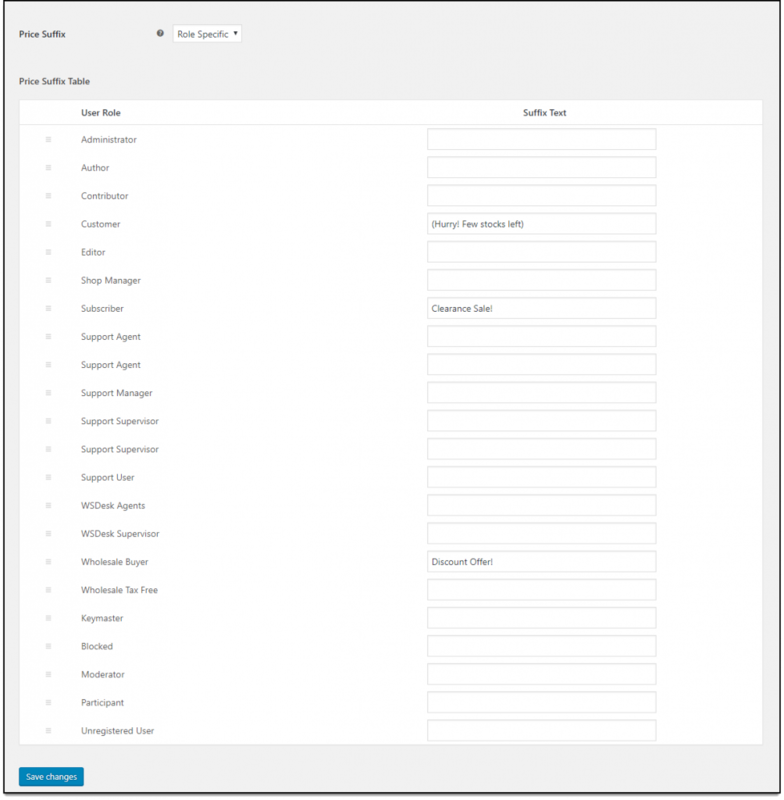 You can select the required user role for role-based pricing on individual products by enabling the respective checkbox for the required user roles. 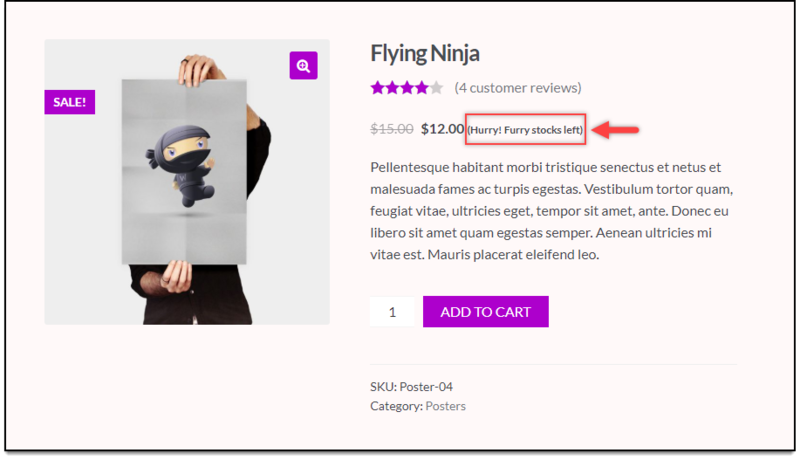 Tip: If you want to custom price adjustments for each category based on a single user role, read How to offer WooCommerce Category Discount? Remove the Add to Cart button & replace with a custom HTML text. Hide only regular price (when the sale price is applied) or hide product price by replacing the price with a custom text message. Hide Cart and Checkout pages for unregistered/guest users. The settings for the same is as shown below. Remove Add to Cart: Tick this checkbox to remove Add to Cart button for your guest users. Once you enable it, a placeholder text option appears, where you can enter the replacement text. Customize Add to Cart: Tick this option to replace the Add to Cart button with a custom message on the product page and shop page. Just like registered users, besides specifying custom text, you can redirect the product link to a custom page (or an external website). Hide Regular Price: Tick this checkbox to hide the regular price, when the sale price is given for simple products. Hide Price: Tick this checkbox to hide product prices. This will also remove Add to Cart button. Once you enable it, a placeholder text option appears, where you can specify the replacement text for the same. Hide Cart and Checkout Pages: Tick this checkbox to disable the cart and checkout pages for your unregistered users. 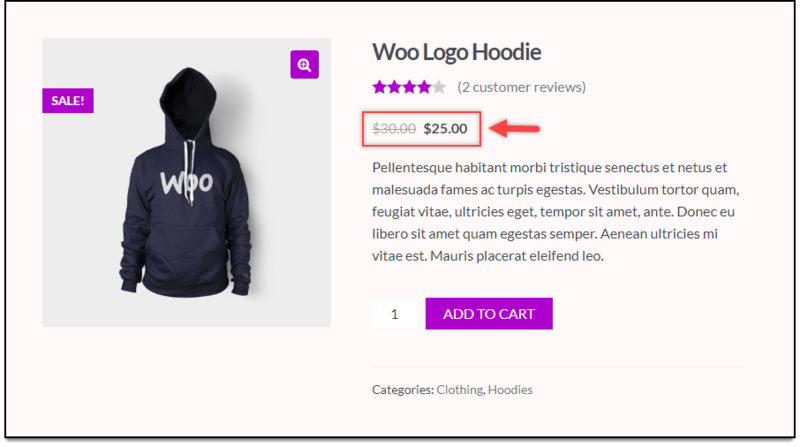 One of the major highlights of the plugin is the WooCommerce Catalog mode. These settings are applied regardless of any user roles. Hide Cart and Checkout pages for all user roles. 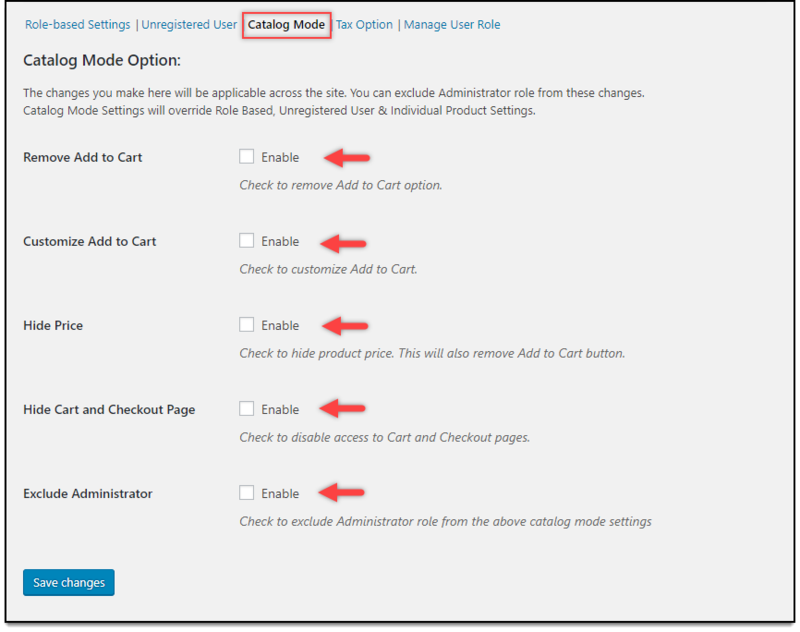 An additional setting here is that you can choose to skip the catalog mode settings for the site administrator by enabling the Exclude Administrator setting. Remember, this will override all other role-based settings for product price and Add to Cart button visibility. Quick tip: The plugin is capable of bringing lots of flexibility to the catalog mode using the advanced configuration options explained in this article. You should turn off the catalog mode to avail flexibility of advanced options. In addition to setting role-based pricing, you can set role-based tax options too. In these settings, you can assign tax classes based on user role. Set custom tax display setting and suffix text. Tick the checkbox to enable role-based tax options. The Tax Options Table appears as shown in the screenshot below. You can select the desired tax class with respect to the user role. 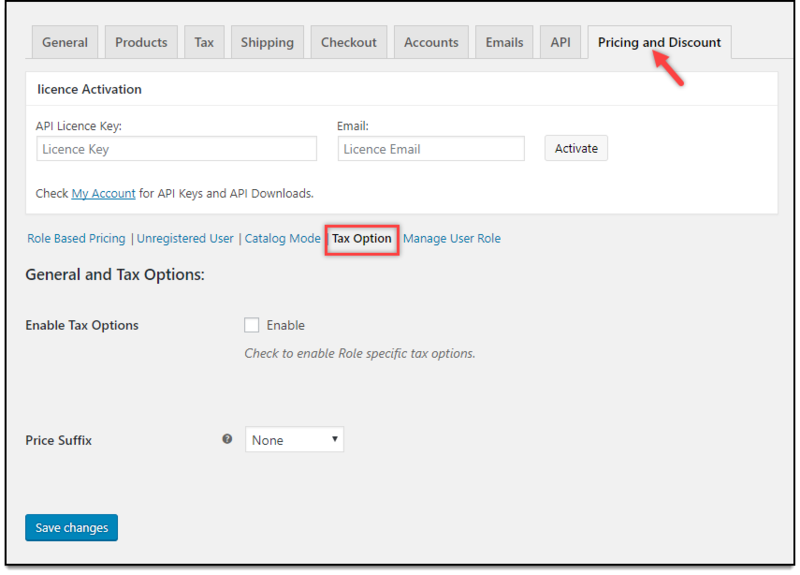 You can keep the default option, to apply the WooCommerce default tax class. You can drag and drop the hamburger icon on the extreme left of each user role to set the priority of the user role. A screenshot of the tax class option is shown below. Quick tip: For a complete understanding of tax options, read how to configure tax options based on user roles? You can specify a general price suffix text, or set custom ones based on user roles. None: No price suffix text. General: A generic price suffix text for all user roles. Once you select this option, a Suffix text option appears, where you can enter the desired text. Role Specific: As the name suggests, allows you to set custom price suffix text based on user roles. Finally, click on Save Changes button to save the settings. A screenshot of sample suffix text for Customer user role is shown below. If the default user roles do not suit your requirement, the plugin allows you to create custom user roles for your WooCommerce store. These user roles are limited to the plugin itself, and cannot be used for other WordPress user functionalities. To create a custom user role, enter the user role name in the User Role text option. A sample screenshot is shown below. Finally, click Add User Role to save the changes. Click on Remove User Role option. A list of available user roles comes into view, as shown in the screenshot below. Tick the checkbox of the user role(s) to be removed, and click Delete User Role. Set Product price based on user role. Adjust prices based on user roles, for an individual product. 1. How to set Product price based on User role? Go to Dashboard > Products > All Products. From the products list, click on the desired product to edit. Next, in the General tab of the product data meta-box, a new option titled Role Based Price can be seen. 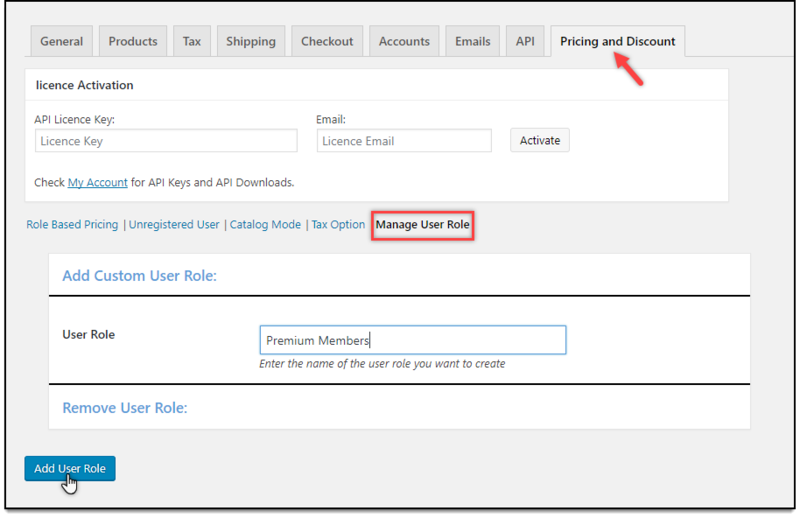 Remember, this section will contain all user roles selected in the Individual Product Adjustment option under Role-Based Setting. Consider an example, where the price of the product ‘Hoodie’ is £30. Let us apply role-based product pricing for Wholesale Buyer user role, and offer the same product for £25 to them. To do this, first, go to the Role-Based Pricing tab. In the Individual Product Adjustment option, select Wholesale Buyer user role, and save the settings. A sample screenshot is shown below. Move to the product settings. In the Role Based Price section under product data meta-box, you can see an option to set product price for Wholesale Buyer. Enter the new product price for wholesale buyers as 25 in the given text field, as shown in the below screenshot. When a wholesale buyer logs in to your store, he can see the custom price for the product, as shown in the screenshot below. 2. How to set up Role-based price adjustment at the Product level? In the product data meta-box, a new tab named Role-based Settings can be seen. In this section, you can configure how the product will accessible to different users. You can also configure role-based pricing for the respective product here. To put it in another way, these settings will help you set price adjustments of individual product with respect to user roles and not price adjustments for individual user roles. A screenshot of the settings is shown below. 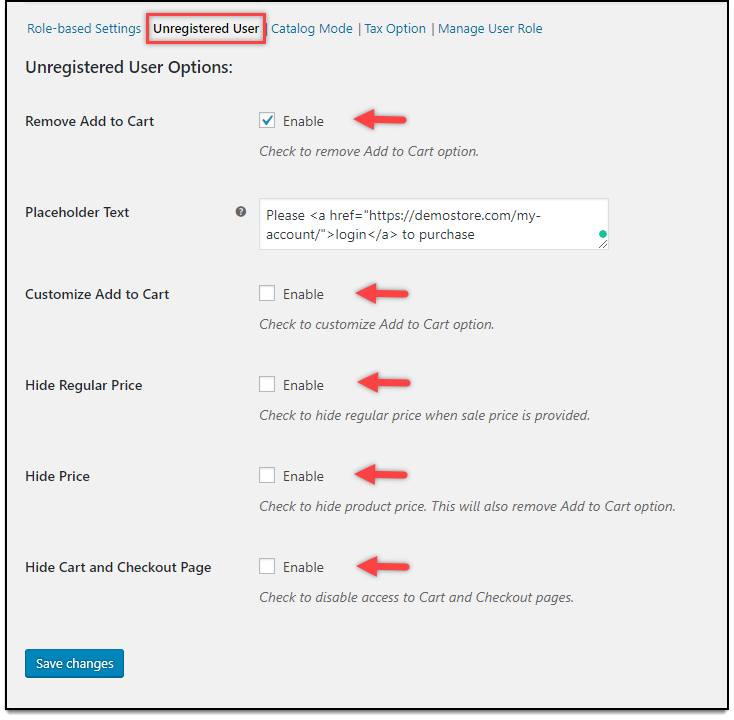 Unregistered Users settings: In this section, you can remove Add to Cart button, customize the Add to Cart button, hide product price, or hide the product completely for guest users. Registered Users settings: This section will help you to remove Add to Cart button, customize the Add to Cart button, hide product price, or hide the product for different user role(s). To do this, select desired user roles in respective the settings. Price adjustment: For this setting, you need first select user roles in the Individual Product Adjustment option under the Role-based Settings tab. Next, you can tick the checkbox to enable Individual Product Price Adjustment. These settings are pretty similar to the Price Adjustment table of Role Based Pricing setting. The only difference is that, in the former, the price adjustment is applied to the specified product, whereas the latter applies to all products of your store. 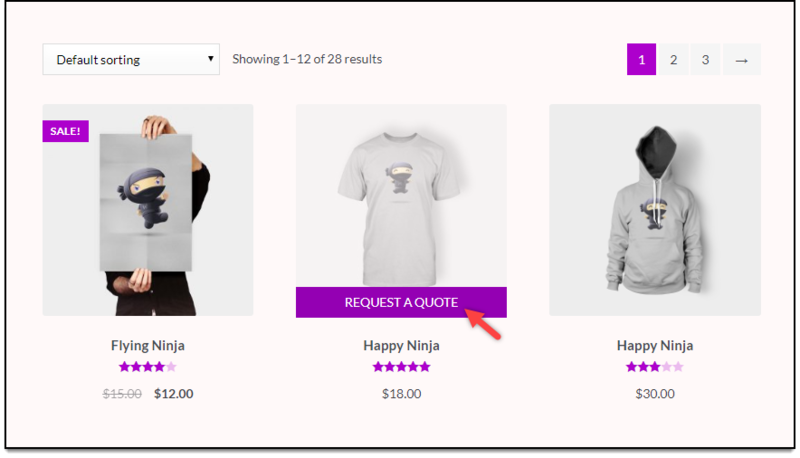 For example, consider two products of category Clothing – Ninja Silhouette and Patient Ninja priced at $20 and $30 respectively. 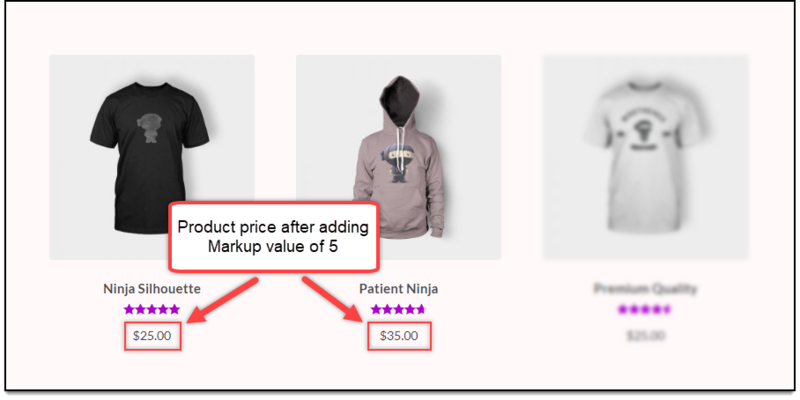 Let us set a price adjustment (markup) of $5 for Wholesale Buyers, and offer a product level discount of $10 for product ‘Patient Ninja’. To do this, first, move to Role-based Setting tab in the main plugin settings. In the Price Adjustment table, enter the price adjustment amount value of 5 and select option M (for Markup) for Wholesale Buyers. Remember to tick the enable checkbox for the respective user role. The settings are configured as shown in the screenshot below. When a wholesale buyer logs in to your store, the updated product price will be as shown in the screenshot below. Next, move to the Role-based Settings section in the product settings of product “Patient Ninja”. 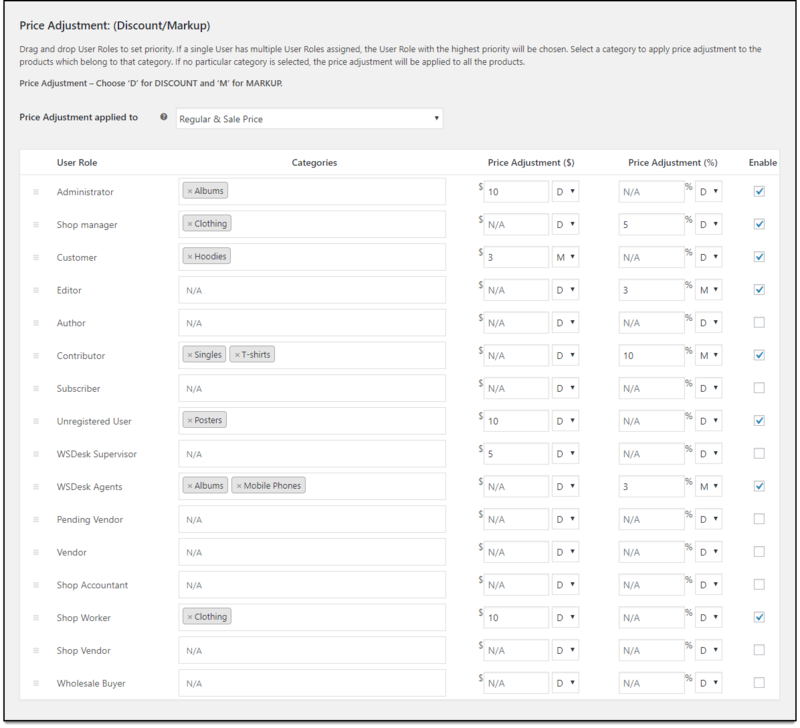 For wholesale buyers, enter a price adjustment amount value as 10 and select option D (for discount), and tick the respective checkbox to enable the settings for the wholesale buyers. 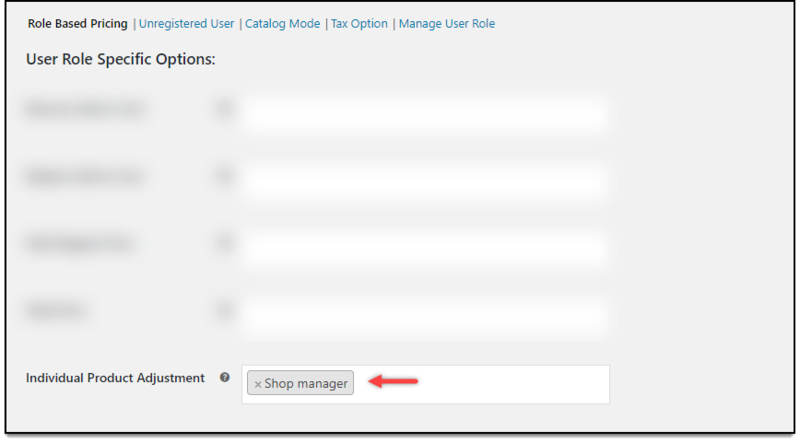 Tip: Remember, to get a list of user roles in this section, you have to select them in the Individual Product Adjustments setting in the main plugin settings. To set priorities, drag and drop the hamburger icon on the extreme left of each user role. The updated product price for wholesale buyers will be as shown in the screenshot below. 3. How to set up role-based pricing for Product variations? Not just at the product level, you can configure role-based pricing at variation level as well. This means the price of each variation can differ depending on user roles. To do this, head to Role-Based Pricing settings in the plugin. 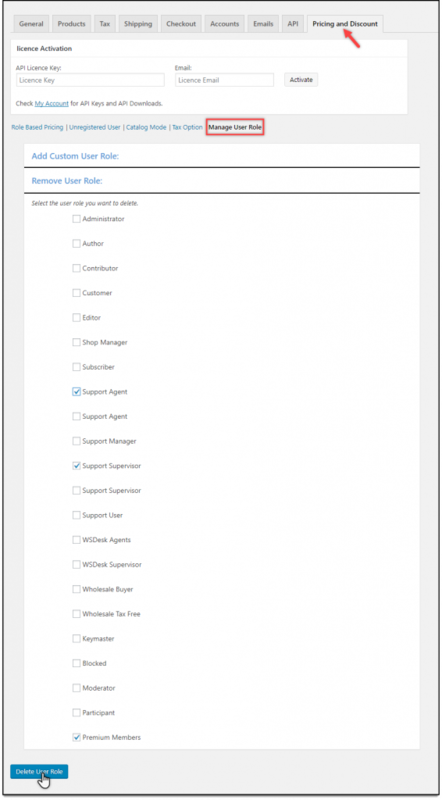 Select desired user roles from the Individual Product Adjustment setting. This setting is important to enable product level adjustments. The setting is as shown in the below screenshot. For example, let us configure our variable product ‘Woo T-Shirt’ for Shop manager with role-based variation prices. In the product edit settings, go to individual variation settings, as shown in the screenshot below. In the ‘Role Based Price’ setting, enter the desired amount for the Shop manager. When shop managers log in to the store, they can see the updated price for each variation as shown in the screenshot below. 4. How to set up Catalog mode for an individual product? These settings are very useful when you want to apply catalog settings for an individual product. You can choose to remove Add to Cart button, customize Add to Cart button, and hide product price. 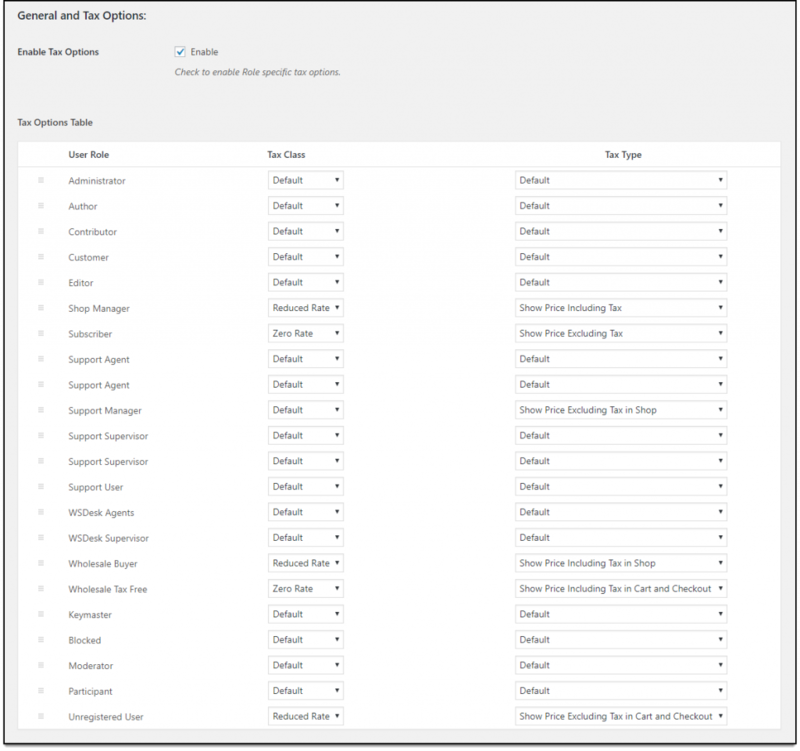 One additional feature is that you can choose to skip applying these settings to site administrator by enabling Exclude Administrator setting. For example, let us consider a product – ‘Woo Music #2’. 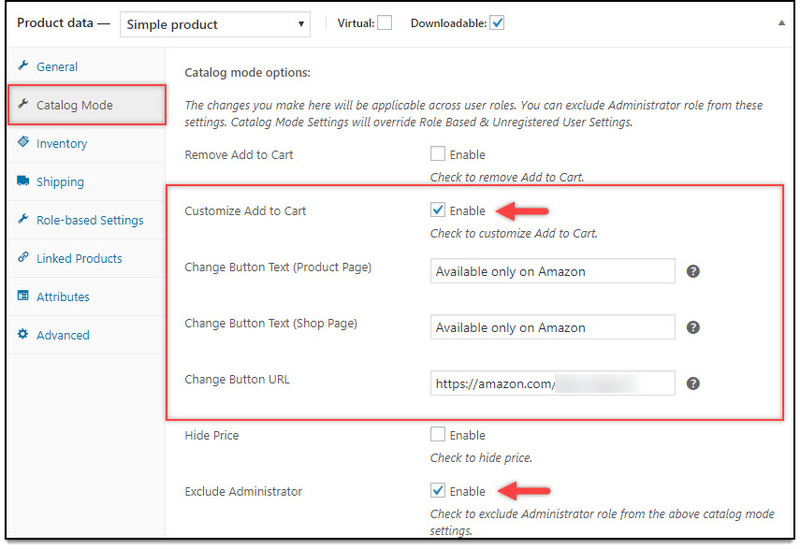 Let us customize the Add to Cart button by changing its text and URL to an Amazon site. The Add to Cart button on the shop page will be displayed as shown in the below screenshot. Now that we have understood the plugin settings, let us discuss some important business cases. In the plugin settings, go to the Price Adjustment table in the Role-based Settings tab. Consider the price of a product is $50. Case 1: Price adjustment for Customer role is $10, as shown in the screenshot below. Hence, the total cost displayed for Customer is $60. Case 2: Price adjustment for Customer role is 5%, as shown in the screenshot below. Total cost displayed for Customer is $55. Case 3: Price adjustment for Customer role are $10 and 5%, as shown in the screenshot below. Hence, the total cost displayed for Customer is $65. 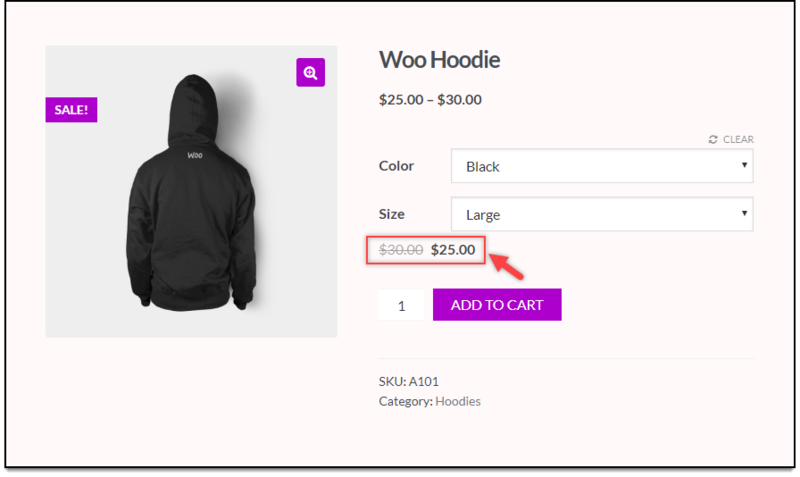 Consider we want to remove Add to Cart button of product Hoodie, for unregistered users of our store. To do this, open the product page to edit. Click on Role-based Pricing tab in product data meta-box. Next, in the Unregistered User Options section, tick the Remove Add to Cart option. Optionally, you can choose to add a placeholder text as well. The affected change can be seen in our store as shown in the screenshot below. In case a user is assigned more than one role, the plugin allows you to prioritize user roles, according to requirement. You simply need to change the order of the roles in the Price Adjustment table. Drag and drop the hamburger icon on the extreme left of user role(s) to set priorities. If a user has multiple user roles, the user role listed first in the use role list will be considered as a higher priority. You can set the priority in the plugin settings, or in the individual product page. For example, a user is assigned the role of shop manager, as well as the wholesale buyer. You can prioritize the user for either shop manager or wholesale buyer user role. Case 1: Shop managers has higher priority than wholesale buyers. The Price Adjustment settings are as shown in the below screenshot. When the specified user logs in, the store appears as shown in the screenshot below. Here, all the prices are adjusted (markup) with $10 for the Shop manager. Case 2: Wholesale buyers have higher priority than shop managers. The Price Adjustment settings are as shown in the below screenshot. Once the user logs in, the store appears as shown in the screenshot below. All the prices are adjusted (markup) with $20 for all wholesale buyers. To explore more details about the plugin, go check out ELEX WooCommerce Catalog Mode, Wholesale & Role Based Pricing.